Early this week, the U.S. Food and Drug Administration (FDA) approved a combination immunotherapy regimen for treating certain patients newly diagnosed with advanced renal cell carcinoma, the most common form of kidney cancer. Specifically, the FDA approved a combination of ipilimumab (Yervoy) and nivolumab (Opdivo) for the treatment of intermediate- or poor-risk, previously untreated advanced renal cell carcinoma. 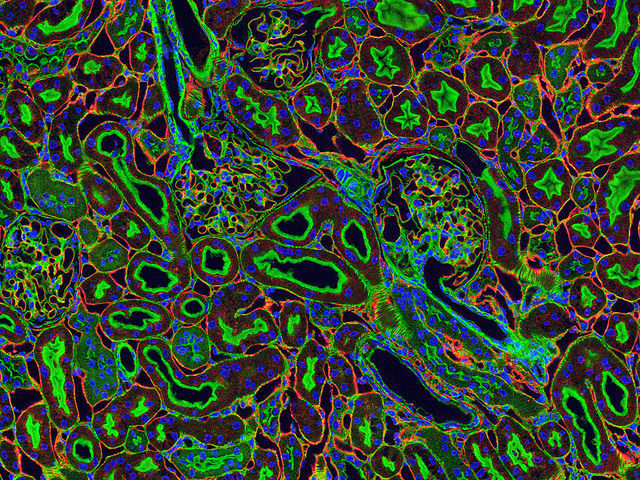 Stained kidney tissue. Image by Tom Deerinck and Mark Ellisman, National Center for Microscopy and Imaging Research. Kidney cancer is the eighth most commonly diagnosed cancer in the United States, according to data from the National Cancer Institute’s Surveillance, Epidemiology, and End Results Program. There are expected to be 65,340 new cases in the United States this year alone. Patients with metastatic kidney cancer have a particularly poor prognosis; the five-year relative survival rate for this form of the disease is just 11.6 percent. Renal cell carcinoma accounts for about 90 percent of kidney cancers. Many patients newly diagnosed with metastatic renal cell carcinoma are first treated with one of several FDA-approved therapeutics that target a number of kinases including VEGF; one of the most commonly used of these therapeutics is sunitinib (Sutent). In this clinical context, the likely prognosis of patients can be predicted depending on the presence of certain risk factors, such as anemia, hypercalcemia, neutrophilia, and thrombocytosis. 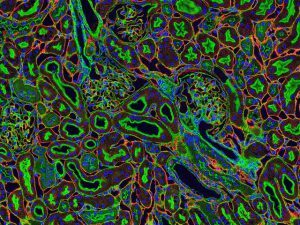 One prediction model developed by the International Metastatic Renal-Cell Carcinoma Database Consortium classifies patients based on the presence or absence of six risk factors. Those who have no risk factors are classified as favorable risk, those with one or two factors as intermediate risk, and those with more than three factors as poor risk groups. The approval of the ipilimumab and nivolumab combination for intermediate- or poor-risk, previously untreated advanced renal cell carcinoma was based on results from the CheckMate 214 phase III clinical trial, which were published recently in The New England Journal of Medicine. In short, patients randomized to the combination had significantly improved overall survival rates compared with those randomized to sunitinib. After a median follow-up of 25.2 months, the 18-month survival rate was 77 percent for the immunotherapy combination arm compared with 60 percent for the sunitinib arm. In addition, at that time, it was not possible to estimate the median overall survival among those receiving the immunotherapy combination, whereas it was estimated to be 25.9 months among those who received sunitinib. The overall response rate, which is the proportion of patients who had complete or partial tumor shrinkage, was also significantly higher among those randomized to the ipilimumab and nivolumab combination compared with those randomized to sunitinib; it was 41.6 percent compared with 26.5 percent. There was no statistically significant difference between the arms for progression-free survival. In addition, according to the FDA statement, the combination did not show efficacy for patients with favorable-risk disease. 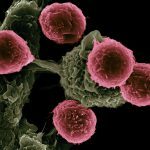 Ipilimumab and nivolumab work by releasing two different brakes on natural cancer-fighting cells of the immune system, CTLA4 and PD1, respectively. As discussed on this blog, they were approved in combination for treating certain patients with metastatic melanoma in September 2015. In addition, results presented earlier this week at the AACR Annual Meeting 2018, which were simultaneously published in The New England Journal of Medicine and highlighted on this blog, showed that a combination of ipilimumab and nivolumab significantly improved the overall response rate and median progression-free survival among certain patients with non–small cell lung carcinoma, compared with standard-of-care chemotherapy. Whether this will lead to improved overall survival and an approval by the FDA remains to be seen, but the data emphasize the potential of combination immunotherapy as an important approach to improving outcomes for patients with cancer.